New York/Juba, April 30, 2017 (SSNA) — The United Nations has called on South Sudanese government and armed opposition forces to stop fighting along the West bank of the Nile River. The call comes as fighting rages in Upper Nile region. 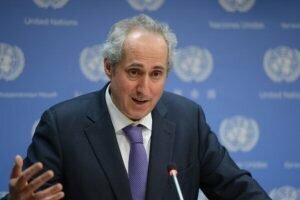 In a statement attributed to Stéphane Dujarric, the Spokesman for the Secretary-General, the UN said the recent escalation of violence threatens humanitarian access to the affected areas. “We are disturbed by the escalation of violence and subsequent suffering of civilians in South Sudan as a result of the recent government offensive. We urge the Government and other warring parties to cease hostilities, uphold their responsibility to protect civilians and cooperate with the United Nations and other humanitarian actors to ensure safe access to all civilians in imminent danger along the West Bank of the River Nile,” the statement reads in part. The statement criticized the government, saying Juba violated its ceasefire pledge it made in last month at an IGAD meeting. ‘The renewed upsurge in fighting represents a callous and blatant disregard of the pledges made during the 25 March 2017 IGAD (Intergovernmental Authority on Development) Summit to implement a ceasefire and to facilitate humanitarian access,” Dujarric said. The United Nations also asserted in its statement that there can be no military solution to South Sudan’s civil war and further call on warring sides to return to the negotiation table. The root causes of the conflict need to be addressed. Calling for a cease fire may be premature, if the agreement of August 17th. 2015 is not revisited for an inclusive government. Truce is a priority but not war. Having a ceasefire can prevent any deaths​ and displacements of civilians. Right now,the focus should be on keeping a peace,so the famine can’t obliterate lives of various civilians who are teetering on the edges​ of starvation and deaths from preventable tropical diseases such as malaria and diarrhoea. The war is anti mobility and safety of the NGOs to deliver services to the civilians in need. The rebels’ rejection of the ceasefire shows that they don’t care about the plight of their own vulnerable civilians and this tells what selfish power Hungry People they really are.